You’ll be pleasantly surprised at your ability to begin dictating immediately after pressing the record button—and at the 5 meters of free movement you have from the docking station. While you’re pacing the office, making notes day and night, you won’t have to stop to charge the microphone. With its new LiPo battery, the SpeechMike Premium Air gives you up to 24 hours of dictation time. In addition, it only requires about 3 hours to charge fully. What a huge boost from the previous 7-hour battery life of the SpeechMike Air! Philips also consolidated the AirPort and AirBridge into one secure docking module—and one less thing to worry about when pairing the microphone. When you dock the SpeechMike Premium Air for 4 seconds, you’re connected to that dock. Not only is this a radically simpler procedure, but the docking station’s new mini USB ports provide better signal transfer and reliability. As for speech recognition audio quality, the SpeechMike Premium Air includes a decoupled studio-grade mic with a built-in noise reduction filter, to help you achieve exceptional results. The SpeechMike also achieves CD-quality signal transmission with the assistance of lossless speech technology—which warns you when you get too far from the dock. 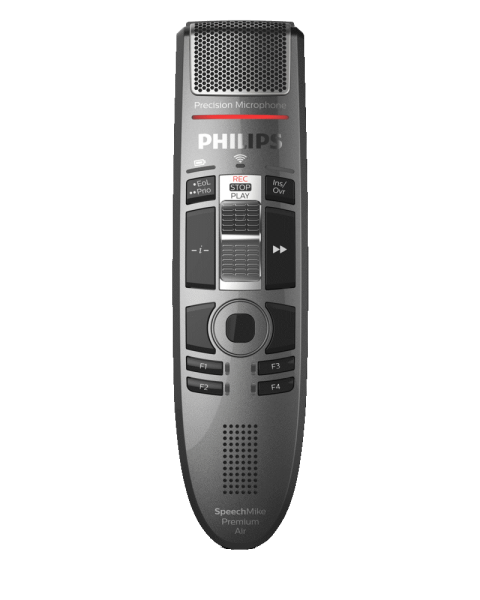 Ready to get started with your Philips SpeechMike Premium Air? We've got you covered. Compared to the Legacy SpeechMike Air? Can someone steal your audio data or pair with your device? Probably not. You’ll be happy to find that the SpeechMike Premium Air transmits audio securely, over a high-quality, proprietary connection. Naturally, the SpeechMike Premium Air can be used with the latest SpeechExec Pro v10 software. Whether you have a speech recognition workflow set up with the Dragon® SDK, or you’re using Philips’ cloud-based SpeechLive solution, you’ll be able to take off a step ahead of the competition. We fell in love with the SpeechMike Premium Air microphone. As soon as we saw the sleek body styling, we knew we were in for a great experience. Not only were our technicians able to plug-and-play using SpeechControl, but we enjoyed the high-quality performance we’ve come to expect from the SpeechMike Premium—all without cable restrictions! We did have some minor concerns about not being able to replace the battery, but with lithium polymer, there’s no need to worry about NiMH (alkaline) replacement packs. For portability, we also noted that you need to take the cradle with you if you dictate on a laptop, since the connection between the cradle and the microphone is proprietary. Your SpeechMike Premium Air cannot be paired with anything other than another ACC4000 docking station. Want to Purchase the SpeechMike Premium Air? While we don’t sell the Philips SpeechMike Premium Air, we can partner you with someone who does. Click the button to find a Philips reseller.